When it comes to cleaning your floors, choosing the best robot mop makes sure you’ll never have to worry about using a mop, broom, or dustpan again. Whether you’re looking for something simple or you want the best steam mop for tile floors and grout, you’ve come to the right place. We researched some of the top-rated, best-selling items and put together this review to help you find the mop of your dreams. First, let’s look at some key features. Type: A lot of these mops play double duty and perform both wet and dry mopping, which is perfect if you have hard flooring. If you’re mostly concerned with carpeting, we found a great dry mop, too. HEPA Filter: Most of these products include a HEPA filter. 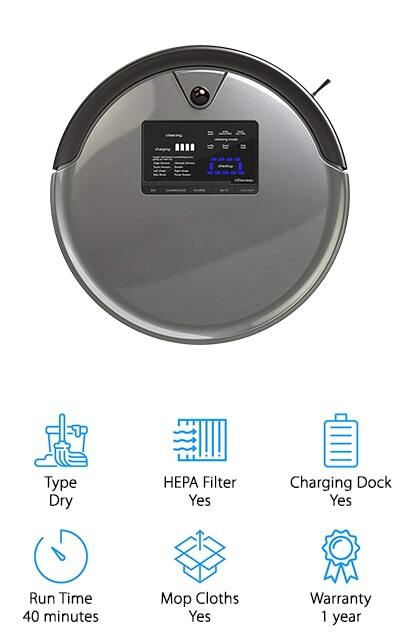 HEPA filters trap a lot of really small particles and prevent them from recirculating in the air. They’re ideal for a home with pets and for allergy sufferers. Charging Dock: All but one of these items comes with a simple charging dock. Just set it up in a clear area and charging is a breeze. Most of them even return to their dock and charge themselves when the battery gets low. Run Time: Run times vary pretty widely. Some only last for 20 to 40 minutes while others can go as long as 150 minutes. If you have a lot of area to clean, consider an option with longer running time. Mop Cloths: All of these products include at least one mop cloth, a few even more. Usually, there is one for wet cleaning and one for dry. Most are reusable and can be washed and reused as many as 100 times. Warranty: All of these items include a 1-year warranty though that doesn’t mean they’re all the same! Make sure you read the fine print so you know what’s covered and what isn’t, just to be on the safe side. Now that you know a little more about what to look for, let’s move into the next part of our robot mop buying guide, our picks for best products. Here’s the deal, all of these options are great but we put our top and budget pick right at the top of the list. That way, if you’re in a hurry, you can still get a pretty good idea about the range that’s available. Alright, let’s get to it! 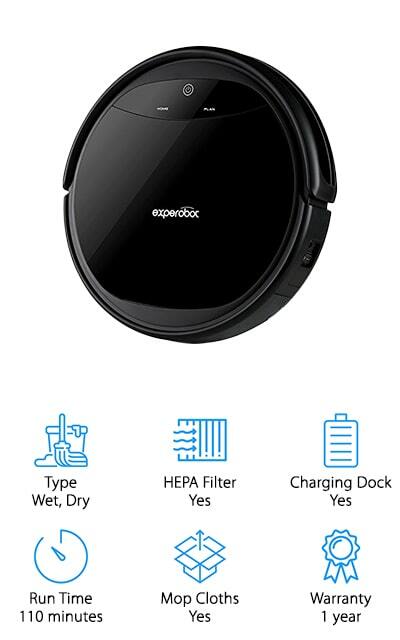 Our top pick for best floor mopping robot is the bObsweep Robotic Mop. This is a great choice for anyone who has pets. For one thing, the dustbin holds up to 1 liter of dirt so it can pick up a lot of pet hair. Plus, not only does it sweep and vacuum, but it also sterilizes with UV light and has a HEPA filter. It gets rid of pet hair, kills germs, and keeps dust and dander out of the air. That’s not all, you can even set up certain boundaries if you want to keep bOb contained to a specific area for a more focused clean. Maintenance is really simple, too. If something goes wrong, there’s an onboard diagnostic system that lets you know exactly what the issue is. For a great robot mop for the money, check out the EVENTER Mopping Robot. It does it all: sweeps, vacuums, sterilizes, mops, and even dries. And get this - it can do it all in one pass! Just press the “clean” button and this robot will begin its full cleaning cycle, easily navigating itself around your home using smart sensors to avoid stairs and other obstacles. There’s even a daily scheduling mode that cleans at a preset time so you can come home to a clean floor every day. You can even choose edge cleaning for corners or mop cleaning for hard surfaces. This mop is best used on hard floors but comes in useful on thin, light-colored carpets. One more thing, when the battery gets low, it automatically returns to its charger. 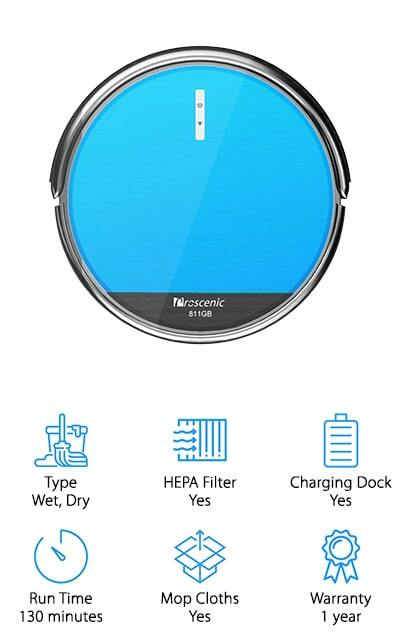 Next up is the Proscenic 811GB Robot Vacuum. One of the coolest things about this one is that there are four different ways to control it. You can schedule it manually, tell your virtual assistant to get it started if compatible, access the Proscenic app on your phone, or use the remote control. Another cool thing is there are 2 different water penetration modes to meet different cleaning needs. It can sweep and mop at the same time or swap in the large dustbin for vacuum only. Boundaries are easy to set up, too, just lay the boundary markers in place to help keep the mop in the area you want it to clean. And get this, at 130 minutes, the Proscenic 811GB has one of the longest running times we found. 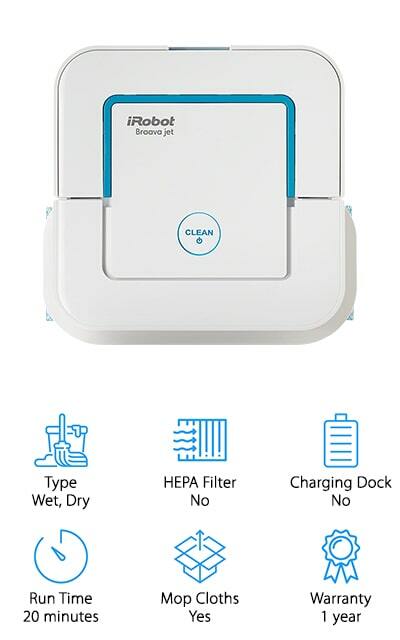 The iRobot Braava 240 is up next in our best mopping robot reviews. One of the best things about this model is its compact square shape. It’s able to get into those hard-to-reach places that tend to get really messy, like around the toilet, under cabinets, and in corners. It’s also great at cleaning up dry or sticky messes, like spilled soda or coffee. What makes it so effective? It’s equipped with a precision jet sprayer and a vibrating cleaning head that gets rid of tough spills. You choose the cleaning pad you need - wet mopping, damp sweeping, or dry sweeping - and the mop automatically picks the right mode. There are actually 2 of each kind of pad included. This is an ideal choice for small rooms with hard flooring. 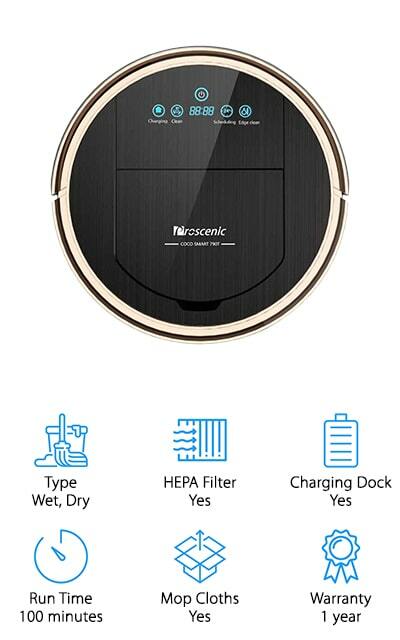 Next in our robot mop reviews is this model from Proscenic. This is a pretty advanced machine that’s even equipped with an automatic navigation system that allows for smart mapping and the development of a logical cleaning pattern to get every inch of the floor as efficiently as possible. And get this, there are even sensors that guide it under beds, sofas, up and down small slopes, and along wall edges, while keeping it away from stairs and prevent it from bumping into anything. The suction is pretty powerful. It even tackles pet hair on hard floors or thin carpets. That’s not all, you can control this model in a few ways, include through the Proscenic smartphone app, by talking to your virtual assistant, or by simply using the remote control. 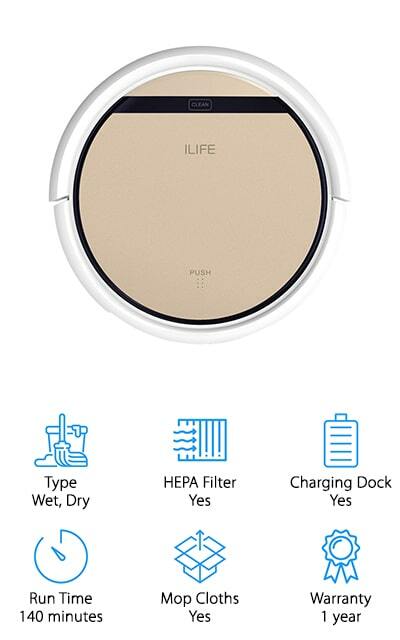 Another awesome wet/dry mop is the ILIFE V5s Pro. The motor is really powerful, able to pick up pet hair, debris, and dust quickly and easily. It’s great for hardwood, laminate, and tile flooring because it does vacuuming, sweeping, and damp mopping all at the same time. Don’t worry, if you just want to sweep and vacuum, you can remove the mop holder and put the large dustbin in and you’re ready to go. We like the wheels on this one, too. They’re larger than comparable models and have self-rescuing technology so they easily travel over uneven floors. One more thing, the running time on this machine is pretty impressive. The battery lasts up to 140 minutes, one of the longest running times we found in our research. Our next pick is the Roborock S511. This is another model that’s pretty advanced. It’s compatible with most operating systems and pairs with a smartphone app that allows you to schedule, set up zones, monitor, and customize cleaning. You can choose different modes as well, like quiet, balanced, turbo, and max. The navigation on the S511 is pretty impressive. It’s able to map your house and plan ideal routes to use for a more efficient and effective clean. Plus, it can cross over elevations less than 2 cm and won’t fall down stairs or bump into your furniture. It’s great for carpet, too. Get this, it automatically senses when it’s on carpet and increases suction. This model has the longest battery life of everything we researched. It can last up to 150 minutes of constant cleaning. 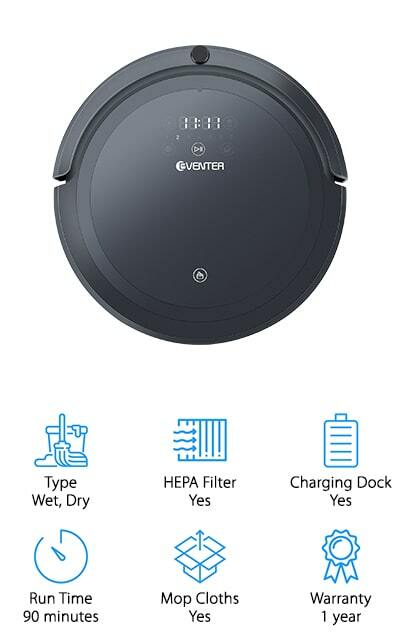 The iRobot Braava 380t Mop uses Northstar Navigation to move around your home. It’s essentially an indoor GPS for your robot mop. This one has 2 different modes, dry sweeping or damp mopping. When it’s dry mopping, it moves in a straight line back and forth across the floor to collect pet hair, dust, and debris. When damp mopping, it moves back and forth in smaller sections to get deep down dirt and grime from your floors. You can use either store-bought disposable pads or reusable microfiber pads. It includes both a wet and dry washable microfiber cloth so you can get started cleaning right away. One more thing, because it’s only just over 3 inches tall, it fits under most furniture and gets right up to your baseboards. 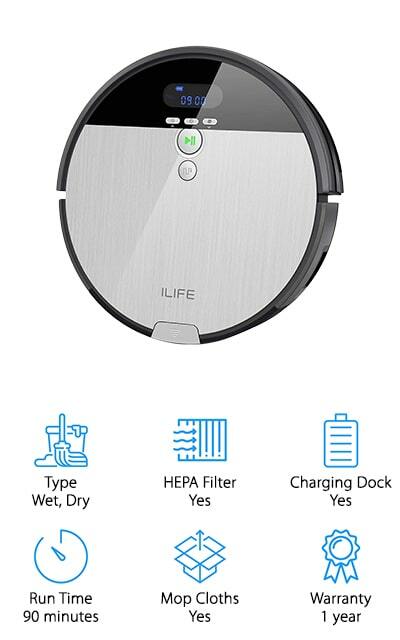 Last up is the ILIFE V8s Robotic Mop. This machine has 6 different cleaning modes. In auto mode, it cleans on its own. Choose path mode and it follows the route you set up for it. There’s max mode for bigger messes that require extra suction, edge to get up close into corners and near baseboards, as well as mopping and spot cleaning. It comes with a remote control that switches between modes at the push of a button. That’s not all, there’s also an LCD display and mechanical buttons right on the machine you can use for an immediate response. 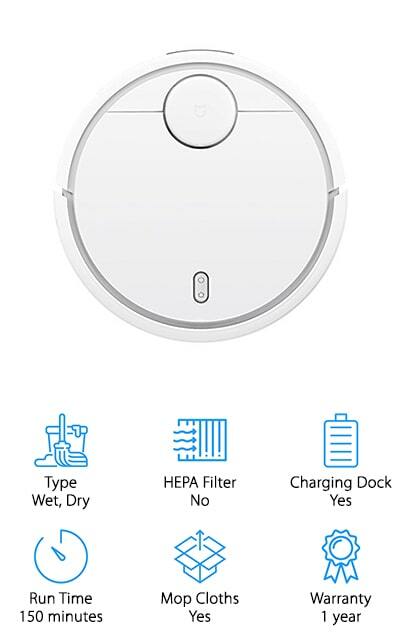 That’s not all, you can even program it to clean on your schedule so you can come home from work or wake up in the morning to a clean floor. 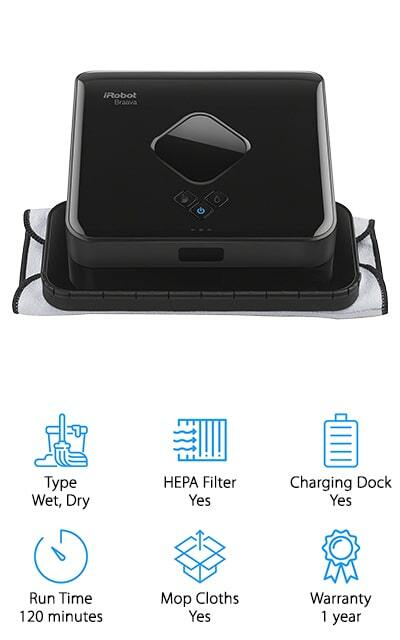 This robotic mop from EP-ROBOT is really effective because it has higher cleaning coverage than most comparable models. Why? Because the dual side brushes and V-shaped rolling brush have an extensive reach and are effective on all kinds of surfaces, including hardwood, tile, rugs, and carpets. Plus, it’s equipped for both wet mopping and dry dust collection to clean up any mess you might have. Drop-sensors and anti-collision features let it navigate your home smoothly for uninterrupted cleaning. That’s not all, it’s also equipped with a dust recognition system that switches between various modes to pick up any dirt that’s left behind. The 110 minute run time is pretty impressive and, when the battery runs low, it automatically returns to its dock for charging. There are 3 modes to choose from, too: edge, zig-zag, and random.